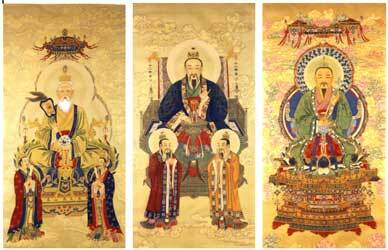 The Three Pure Ones are the highest Deities in Taoism. “The Three Pure Ones”transcend the entire hierarchy of Taoist deities. In the middle is the ultimate highest deity of Taoism, the Primordial Heavenly Worthy. To your right is the Spiritual Treasure Heavenly Worthy, and to your left is the Supreme Way Heavenly Worthy. "The Three Pure Ones" is the avatar of Taoism. AVATAR is a word that is commonly heard but rarely understood. In English, the word has come to mean"an embodiment, a bodily manifestation of the Divine." The void or great emptiness in the beginning, is called "Wu Chi", or primordial chaos, at this state the Tao is a disperse form or "Chi" when reunited it is transformed into a divine being. This divine being is Tai Shang Lao Zun or Supreme Patriarch Lao Zi.